Mangoes are one of the most common fruits in the world. It originated in South Asia, and were eventually distributed around the world, which became one of the most cultivated tropical fruits. It is so sweet that a lot of delicacies and drinks have been made out of it. It is often made into a creamy smoothie which is loved by everyone. Every glass full of creamy mango smoothie has rich amounts of vitamin C. Mango by itself can give consumers 40 mg of Vitamin C. This is further enhanced by turning it into a smoothie, raising the vitamin C content to about 46 mg per day. 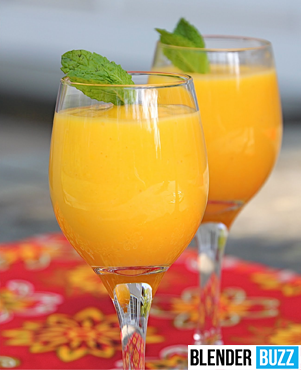 Furthermore, creamy mango smoothies are also rich in antioxidants such as fiber, gallic, and polyphenols. A glass full of mango smoothie gives you enough dose of vitamin C, potassium, fiber, and antioxidants. Peel the mangos and remove the seeds first. Slice the mangoes ahead of time. Slice it into cubes or chop the fruit so it would not be too hard to blend and process. Chopping the fruit into smaller pieces speeds up the blending process. Add the mango fruit, the mango sorbet, and fat free french vanilla yogurt (rich in fiber) to a clean blender. Using a high performance blender will give you the best smoothie and you are guaranteed that it will last a long time. To avoid spills, seal the contents of the blender properly. Add skim milk or soy milk to minimize calories. Pulse the blender until the mixture turns into a smooth consistency. Pour into the glasses and serve immediately. If you have prepared for a day’s worth, make sure to refrigerate the rest of the smoothie to avoid spoilage. If you want your smoothie to last a little longer, coat lightly in lemon juice or with the use of fruit preservatives. This will minimize spoilage or browning. If you have extra fruits, store in a tightly sealed container in the refrigerator. A creamy mango smoothie can be a lot healthier if you add a small amount of vegetables like spinach and bell peppers in the mixture. These vegetables will not affect the taste of the smoothie. Furthermore, it contains a variety of nutrients which make the smoothie a very healthy alternative.